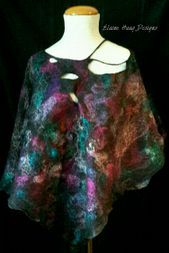 Each Elaine Haag Design is an original, custom, wearable art by a process called Nuno felting. Nuno felting combines fine silk and natural fibers, such as merino wool, soy, or silk. Using only water, soap, and hands-on agitation, the fibers migrate through the silk creating a magical transformation. Nuno felting has become my passion in this fibrous chapter of my life. I put a great deal of thought, energy, heart, and soul into creating an eye-catching, luxurious fashion statement. I want the people who wear my designs to feel spectacular and magnificent; to know they will not see another piece like theirs on anyone else. My desire is to share my Nuno felt passion by creating high quality, lasting pieces for many to enjoy.